Max had a dog bowl that got his food and water everywhere. I hated it! That is- until I came across The Neater Feeder! 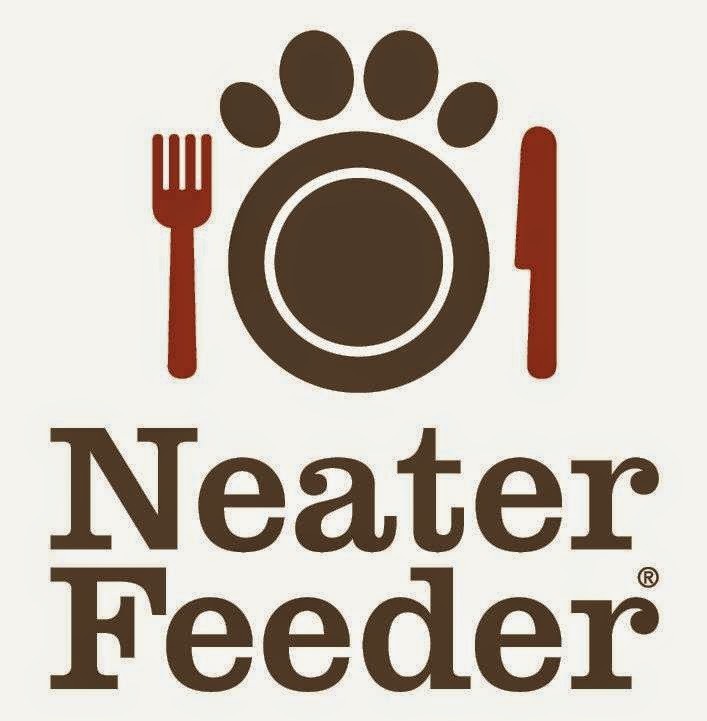 The Neater Feeder is a revolutionary spill-proof pet feeder for dogs and cats. The Neater Feeder takes the mess out of meal time with its spill-proof, kick-proof design. Spilled water drains into the lower reservoir, while food is contained on top. It is a product that is just genius! I received a Small Neater Feeder with leg extensions! The Small is perfect for dogs under 18 lbs and comes with a 1.5 cup standard stainless steel food bowl and one 2.2 cup extra capacity stainless steel water bowl for your convenience. Without the extensions, the bowl is only 3 inches off of the floor and with them, it is 4.5 inches off of the floor. This reduces neck straining on Max. I have noticed a huge difference in his eating since we received it. His posture is better as well. I love how the water or food falls through the holes to the bottom and you can just lift and dump. It is convenient and easy for sure! Overall, we are thrilled and we love the Neater Feeder! It comes in Bronze or Cranberry! You can purchase other products as well. They have the Neater Feeder Deluxe For Cats , Medium Neater Feeder Deluxe, & Large Neater Feeder Deluxe! Check out other products on their website via one of the links here in this post! If you want the Small Neater Feeder Deluxe for your pet, you can purchase it for only $37.98! You can also visit them on their social media below to stay up to date with the latest! 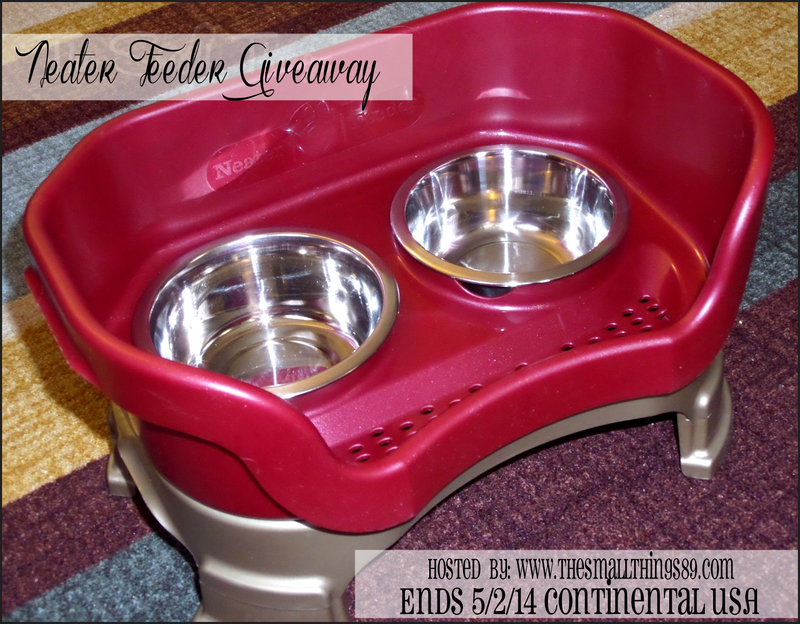 Win it: One lucky reader is going to win a Neater Feeder on their choice! Need one for your cat, a large, medium or small? Your choice of color and size is up to you! You win- you get it! Winner must live in the Continental USA and complete the mandatory entries to qualify. Giveaway will end on 5/2/14 at 11:59PM CST. No purchase necessary to enter. Enter with the giveaway tools below and goodluck! I have a large one for my adult dog, but just got a puppy and he's tiny, so I'd choose a smaller one for him. He's really messy, so I could sure use it! I would want the Large size for my red healer. As it is now, he has to drink out of a bowl that sits on the floor. He always wets the floor. I have the bowl sitting on a towel which absorbs some of the water but its still messy. I like the Cat Neater Feeder Deluxe in bronze. If I won this, I would want a size small. Right now I have a mat under her dish's because she sure does make a mess. I would need the large for my German Shepherd. Kyla is a mess-maker and this would really help to keep the food where it belongs. I would like the Cat Neater Feeder Deluxe my dog of 12 years just passed away and have a new kitten. Gizzy thinks she needs a large, but I know better. My Teddy Bear Dog is the perfect size for the small. I'd like a large in cranberry. I would want a large Neater Feeder. I would want the one for cats! My dog needs the medium red feeder. She spills water when she drinks all the time. My dog would need the large size, and he could definitely use this! Gee, I could really use multiple Neater Feeders. I have five Treeing Walker Coonhounds, a couple of who are especially messy drinkers. For them I'd want a large in Cranberry. We also have three cats, with one being 7 months old and still on kitten food, so I'd love two - one in bronze and one in cranberry. I'd go with the large one first, though, since the dogs are the ones who make the most mess. I think this Neater Feeder is a brilliant idea. Every day is seems I am walking on dog food and wiping up water from our beagle's meal times. I also think this feeder would help control portions and control over-feeding. This would be perfect for our dogs. Our male somehow manages to get half a bowl of water on the floor everyday. We're just lucky none of us has fallen. I don't even know how he does it.